Anupo Joy is a warm natural intuitive who is known for her loving heart and the clear perception she brings to her work. She has conducted over 43,000 individual clairvoyant, clairaudient and medium consultations with people, corporations and animals. Some of the training Anupo has received to increase her innate skills include deep integration of diverse forms of meditation, remote viewing (ARV, CRV, ERV, SRV) and receiving Master Practitioner and Trainer standing in Neuro-Linguistic Programming (NLP). Anupo works almost exclusively now with animals and their people through phone consultations, in home, stable visits and entertaining speaking engagements. She has written numerous articles and stories on Animal Communication and Intuition, produced CDs, is a co-author of the best selling book Wake Up Live the Life You Love: Seizing Your Success and author of 52 Tips, Talking with Animals more Easily. For the main Website click the image below. There are lots of fun new changes to the Website! To Purchase Gift Certificates click the image below. Caffe and I have connected. She explained that she knows she gets overly excited sometimes and that when she does, can hear you and knows what you want she can't stop the adrenaline. She's a little embarrassed about not being able to stop. She also knows that you like her excitement so it's confusing for her. Calming signals would work well in this case. When she gets excited you can slowly yawn and blink. And if you don't mind you can also add a lick of your upper lip. These are signals that dogs give to each other to calm each other down. Next while she is calm you will want to create a film clip in your mind of the behavior you would prefer from her. She is young and is still figuring out what your thinking means. Make it easy for her with a film clip of mental pictures, sounds, words and smells. To send a question to Anupo for this column send the question by email to anupo@uniquebliss.com and on the subject line type Question Column. An early memory of the lemon tree is the first memory I have of the fairies and earth spirits. My little brother and I were sitting on the wild grass that grew under the tree and I was telling him what I saw. Filaments of energy - light moving and playing around the tree. Then we felt a warm puff of sweetness the fairies sent to us, in response to a little girl's recognition of their presence. I was about four at the time. To Order the book click on the image above. $14.95 plus tax and shipping. I was talking with an orange, adolescent Tabby cat the other day. The topic was his hunting and what he did with his prey. Recently he had been hunting lizards and he would bring them onto the porch leaving them there dead or maimed. In our conversation I talked about how it was OK to hunt and kill his prey IF he was going to eat it. However IF he was not going to eat it he needed to leave the creature unharmed and able to go on with it's life. Partway into the conversation Tiger became very busy with bathing. In this case, it was his way of dealing with internal conflict. When I brought him back to the topic I remarked about how much more skill it takes as a hunter to not damage an animal and I wondered just how skilled a hunter he could become. I mentally showed him pictures of his adult male cat friend (who just happens to be my own sweetheart Tuddy) and how he brings me the gift of his prey. I showed Tiger how the lizards that were brought into my kitchen and carefully placed on the little rug were healthy and unharmed and how Tuddy and his sister would follow me to the lizard release area and watch them go. As I gave him a playful rub and tussle I wondered just how skilled a hunter Tiger could become? Once a year we have a Special Discount. Prepay for 5 hours of phone and/or in person consultations and get a 6th hour FREE. You can give an hour or two away as gifts or even all six if you like. 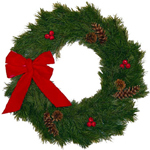 * Special Discount available only through December 20, 2005. October Wow! $200,000 That's what this years San Diego Humane Society & SPCA's Fur Ball raised! If you didn't get to attend I highly recommend next year. 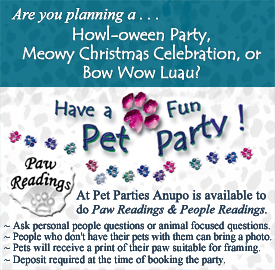 It is a wonderful fun filled event and I have a great time doing Paw Readings. A pod of dolphins circled swimmers 300 feet off the coast of New Zealand, herding them into a tight circle, then swimming around them. The swimmers soon noticed outside the pod of dolphins circled a great white shark. The shark was attempting to get through the dolphins to the swimmers. The swimmers, experienced Lifeguards spent the next 40 minutes surrounded by the dolphins until the shark swam away. Dolphins are known to protect their young from sharks in this way. Though the protection of a group of humans is unusual stories of dolphins aiding humans in the ocean go back to antiquity. * Please remember to donate to AniMeals this Holiday (or any other time). 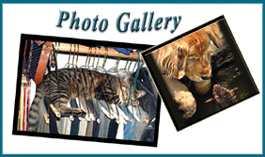 The Animeals program is run by the Helen Woodard Animal Center. Bins for donations are in all the PetCos in San Diego County. The program offers free pet food for the dogs and cats of elderly throughout San Diego County, many whom could not keep their companion animals without this help. 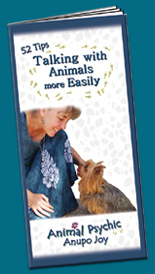 A Pocket Guide to Telepathic Communication between People and Animals. To order the book click the image above. Available in a quantity discount for the Holidays. "Being a male, engineering type, your book reminds me of a computer software quick-tutor. It’s a quick and good read, I can refer back to it as often as I like and find one of your tips easily. To SUBSCRIBE click here then type subscribe in the subject line. To Unsubscribe click here.